New Delhi: With the growing need for developing alternative methods through specialized education to create a sustainable living TERI Universitygraduates today, at their convocation ceremony, dedicated themselves to the importance of environmental protection and the need to maintain equity, ecological security, and the wealth of natural resources. 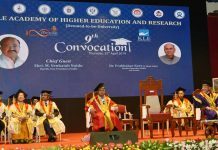 TERI University held its Tenth Convocation ceremony today in which 18 students were conferred with doctoral degrees and 195 received master’s degree from the university. Present on the occasion were Mr. Anil Baijal, Hon’able Lt. Governor, Delhi as the Chief Guest for the convocation and Ms. Monique Barbut, the Executive Secretary of the United Nations Convention to Combat Desertification (UNCCD).as the Guest of Honour, along with Mr. Ashok Chawla the Chancellor, TERI University, Dr. Leena Srivastava, Vice Chancellor TERI University and Dr. Rajiv Seth, Pro-VC TERI University. The Guest of Honour Ms. Barbut, UN Under Secretary General and the Executive Secretary of the United Nations Convention to Combat Desertification, called on the new graduatesto be innovators, and challenged them to “Imagine what your villages of the future will look like.” She stressed that whereas knowledge is important, it is a tool to help us to imagine how to change the challenges we face.“In each new challenge, I apply what I have learned, but I also try to imagine an entirely different way to get things done. Because it takes at least one person, with imagination, to think something is possible before it can ever come to pass,” she added. Water Resources, waste management and sanitation: Various projects such as Urban water metabolism, Landscape approach for water management in Gangetic planes, Water-energy nexus, and Urban water and sanitation, strengthens various flagship missions loudly promulgated by the Government of India viz. Skill Development, Smart cities and Swachh Bharat Mission. Our approach includes (i) basic research to guide policy with evidence, and (ii) strengthening the capacity of Institutions and Stakeholders. Energy and Emission Management: University has carried out projects on integrated energy-environment systems modelling and their implications on global and local environment and health. We worked on impact of various urban infrastructure schemes on mitigation of greenhouse gas emissions for COP-21 (for Ministry of Urban Development), sustainable mobility and strategic energy and environmental analysis for multi-modal transport system. School awareness programmes: School University Network (SUN) of TERI University is an initiative to trigger curiosity and creative thought processes in sustainability science amongst school children and to build communities for bringing positive change in local areas. Urban Development and Sustainable Buildings Management: Cities are engines of economic growth and can lead investments required for sustainable infrastructure. The urban approaches chosen, and the infrastructure decisions made will have severe consequences in climate change adaptation and mitigation; and Responsible Consumption and Production. TERI University has structured first-of-its-kind masters courses on ‘Sustainable Consumption and Production’ for mid-career policy makers and professionals. TERI University is the only institution of advanced learning in the country established with the mission of contributing globally by serving society through formal education and research in fields like environment, sustainability, energy conservation, policy and management. At the Convocation, MA degrees were awarded in Public Policy & Sustainable Development (PPSD) and Sustainable Development Practices (SDP); MSc degrees in Environmental Studies and Resource Management (ESRM), Geoinformatics, Plant Biotechnology (PBT), Climate Science and Policy (CSP), Water Science and Governance (WSG), and Environmental and Resources Economics; MTech in Renewable Energy Engineering and Management (REEM) and Urban Development and Management (UDM), Water Science and Governance (WSG); and MBA in Business Sustainability and Master of Laws in Environment and Natural Resources Law, Infrastructure and Business Law. In its more than decade old existence, the University has become a centre of research excellence in its field, producing over 1200 post graduates with high-level cross-specialisation skills in environment and sustainability fields as well as nearly 80 PhDs, who have gone on to contribute to society through engagements with corporate-driven CSR initiatives, leading NGOs, government agencies and statutory bodies working in the field and have even become social entrepreneurs. TERI University has partnerships with various universities and institutes across the world. To walk-the-talk, the TERI University campus provides a setting which enhances learning and showcases the concept of modern green buildings. The campus is aesthetically designed with several features of passive solar design, energy-efficiency and water and waste management systems. TERI University students undergo training and internships with government, multilateral and multinational agencies during as a part of academic curriculum. The university has a placement cell, as employment is considered as an integral part of the system. The cell taps government agencies like Dept. of Environment (Govt. of NCT, Delhi), FAO, multinational companies like ACC, Tata Power, Reliance Energy Ltd. and multilateral organisations like WWF, Action Aid International etc. for internships and employment programmes.